As great as squats are for building strength and improving body composition, they’re not right for everyone. If knee pain or an injury is holding you back, or if you’re simply sick of squatting all the time, there are plenty of ways to get a great lower-body, booty-sculpting workout without doing a single squat. Here are five squat alternatives to tone and tighten those glutes. Step-ups tap into a motion you probably do every day: climbing stairs. This exercise will improve your climbing endurance and stamina, and strengthen your quads and glutes. To do dumbbell step-ups safely and effectively, you want to make sure your form is on point. Hold a set of dumbbells with your palms facing inward toward your body. Keep your shoulders back and down — do not shrug your shoulders forward or upward during this exercise. As you step up on the platform, plant your foot firmly and make sure your knee never extends past your toes. This can take some practice but it is for the safety and health of your knees to be careful. When you take the step up, raise the knee of your opposite leg to about hip-height. Take care not to lean too far forward —you want to keep your back and shoulders aligned and straight. Repeat with the other foot. 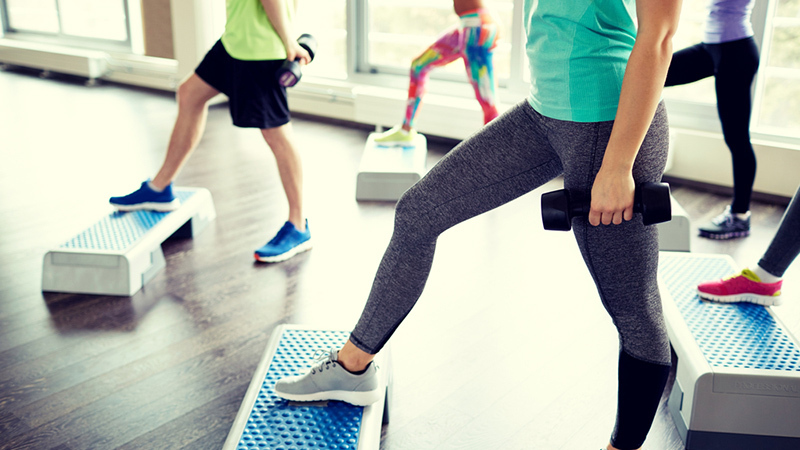 Dumbbell lunges are a highly effective lower body exercise that target your glutes, hamstrings, inner thighs and calves. Because dumbbell lunges work multiple muscle groups, the exercise is known as a “compound” exercise. Hold a dumbbell in each hand by your sides, starting in a standing position. Step forward with your right foot and lower yourself down to the ground until your right leg forms a 90-degree angle. Keep your chest and head straight, and keep your feet in position as you lower yourself. Return to a standing position, forcing your weight through your right heel. Repeat 10 to 15 times for each leg. Donkey kicks combined with a resistance band will strengthen your legs, core, and lower back, but especially your backside. Get ready to really feel the burn! Begin on all fours with your hands shoulder width apart. Keep knees straight and in line with hips (like a donkey). Being your right knee, lift your right leg up and back. The bottom of your foot will be parallel to the ceiling. Complete 12 repetitions. Rest, then repeat with left leg. You can use a mat with this exercise to cushion the knees. Deadlifts are rightly renowned for building strong hamstrings and glutes, but the single-leg deadlift provides the added bonus of promoting balance and coordination with each downward movement. Stand on one leg and hold the other leg a few inches above the ground. While holding two dumbbells in both hands or a heavy weight like a medicine ball, lift the floating leg backwards and reach both dumbbells in your hands down toward the ground. Return to the start to complete a rep.
Not only does this movement require no equipment, but it’s excellent for your back muscles as well. The exercise itself is relatively simple, but surprisingly challenging. Begin lying flat on the floor with your knees bent and your hands by your sides. Lift your hips off the floor, keeping your back straight. Raise one leg straight into the air to form a line with your torso. Hold the position at the top for a moment, breathing out, then slowly return to the starting position. Do two sets of 15 to 20 reps for each leg. For added resistance, place a weighted plate on your pelvis. As with any workout, make sure you cool down and perform some dynamic stretches afterwards afterwards. Although some people are die-hard squatters for life, these squat alternatives will do the trick if your sick of the traditional squat routine. Your legs, back and booty will thank you!